I’ve been in the market for an indoor security camera. These cameras offer some unique advantages over standard webcams, like motion-activated clips that let me keep tabs on my home from anywhere, and intelligent alerts that can be customized to notify me of potential break-ins. An indoor security camera would also give me a chance to monitor for any puppy mischief that might occur when I’m not there. As the security camera market flourishes, Amazon has thrown its Cloud Cam into the ring. The company’s first step into the security market has left many, including myself, wondering whether the camera and the Cloud Cam app stack up against major contenders like the Nest Cam Indoor and Nest Aware. Price Free $6.99/mo. or $69.99/yr. $9.99/mo. or $99.99/yr. Free $6.99/mo. or $69.99/yr. $9.99/mo. or $99.99/yr. 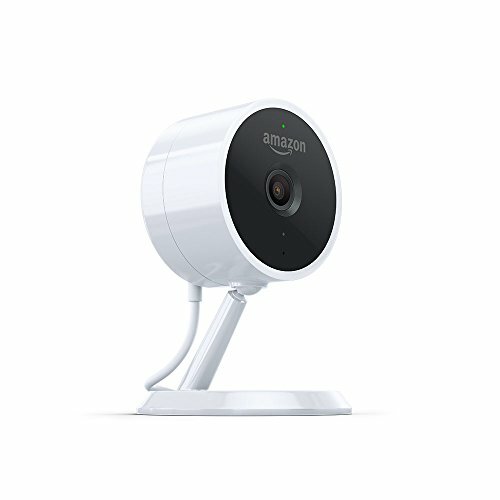 Amazon’s Cloud Cam subscriptions are comparable to that of Nest Aware, but the Nest Cam itself is quite a bit more expensive, coming in closer to $200. You can download the Cloud Cam app for free on the Apple Store or Google Play. Although the Cloud Cam’s eight infrared LED lights can be an eyesore in the dark, the night vision is impressively sharp. You can see the dark room clearly at night and even make out the details of faces as people walk through the room. With the free plan, the motion detection feature will notify you at the subtlest movements. Pets, activity outside windows, or even sudden lighting changes can set off notifications. If you’re determined to keep the free plan, you’ll have to either sort through a barrage of unnecessary notifications or turn them off altogether. Like the boy who cried wolf, the Cloud Cam might inundate you with so many false alerts that you’ll miss the one that matters most. Another drawback to the Cloud Cam is that it doesn’t offer professional monitoring. That means you’ll have to personally manage motion detection alerts, and call the authorities in the event of a break-in. If you’re interested in a professional monitoring service, check out our post on the best home security systems. Amazon hardware has a reputation for simple packaging and intuitive setup, and the Cloud Cam lives up to that standard. I simply plugged the camera into a power outlet and the Cloud Cam app automatically detected and synced with the camera. I had a livestream of my living room up and running within minutes. The camera comes on a basic standup mount and additional hardware for ceiling or wall mounting. Because the Cloud Cam offers a 120º field of view, I easily found a spot where it could monitor the entire room. The Cloud Cam app was also easy to use. From the app I was able to watch live footage, download clips, manage my subscription, and change my intelligent alert settings. The Cloud Cam easily syncs with your home automation if you already have an Echo device. My Echo Spot immediately detected the Cloud Cam in my living room, and I was able to control the camera with Alexa’s voice commands. You can use Alexa to cycle through different cameras in your house, manage your motion detection notifications, and pull up live videos. For example, with my Echo Spot, I was able to watch a live feed of my living room while I cooked in the kitchen. That extra set of eyes would be great for parents or caretakers who want to keep an eye on their kids from another room. With the puppy at home, roaming about the living room, his coming and going triggered a notification to my phone every few minutes. After a while I turned off the notifications altogether, which was problematic. Without the Cloud Cam’s intelligent alerts, the only way to monitor for potential break-ins would be by watching the live feed. If you have pets roaming about the house, you’ll probably want to pay for a subscription so you can enable person detection and eliminate unnecessary notifications. Cloud Cam reviews are mostly positive, with many reviewers praising the camera’s easy setup and high quality video footage. A lot of the negative feedback in the reviews has been addressed by Amazon, so keep that in mind when looking at older reviews. The Cloud Cam’s 1080p footage is sharp enough and the night vision is clear enough to compete with many of the best cameras on the market, including the Nest Cam Indoor. Amazon’s willingness to update the Cloud Cam and the Cloud Cam app also means it will continue to improve over time. The free plan is still somewhat problematic, as you can’t adjust notification parameters, but it’s more serviceable now that you can download video clips. And if you’re willing to pay for a subscription, the Cloud Cam is hard to beat––especially if you already have an Echo device in your home. Do you have experience with the Cloud Cam? We’d love to hear your thoughts in a comment below.